I remember it vividly. I was sitting on the couch in the living room watching cartoons. My mom came home from the grocery store and had bought me two comic books: G.I. Joe #100 and Robocop #4. They were the first two comic books I ever owned. This simple act basically changed my life. 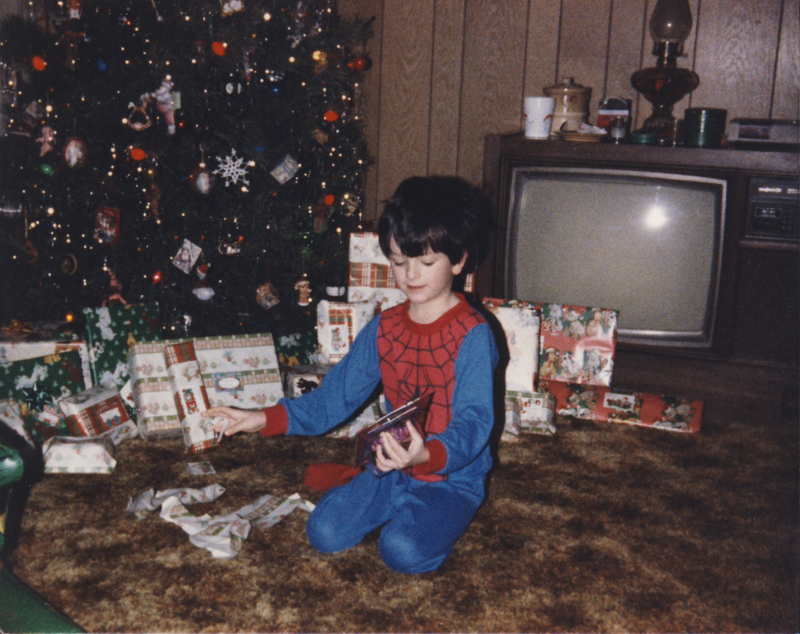 This small man opens presents in his Spidey jammies. When I was very young, I liked Spider-Man. I'm not sure how I knew who he was because I didn't watch the self-titled cartoon or Spider-Man and His Amazing Friends until much later, but there are pictures of me wearing Spider-Man pajamas as a kid. In fact, there's one over there on the right. That's me, probably opening up a He-Man action figure on a Christmas morning in the 80s. Even though I liked Spider-Man, I didn't know anything about comic books. As I mentioned in the opening, I remember the moment I received my first two comic books. Going by the dates that those two books were published, it more than likely would have been June of 1990 when I was given these. In addition to those, I also soon acquired two issues of the DuckTales comic and a Roger Rabbit comic. The second DuckTales comic and the Roger Rabbit comic were both published in July of 1990, so all this lines up correctly in my memory for once. Around this time I was spending a lot of time at my grandparents' house. They had just bought a new house and lived just outside of a tiny town called Creal Springs. My grandma owned a flower shop in Creal and next door to her was a tiny grocery store named Horn's Market that sold old comics. If my comics weren't coming off the rack at Wal-Mart, they were coming from Horn's. I would go through the rack of comics and try to find as many Spider-Man comics as I could. This was the start of me getting into super heroes. 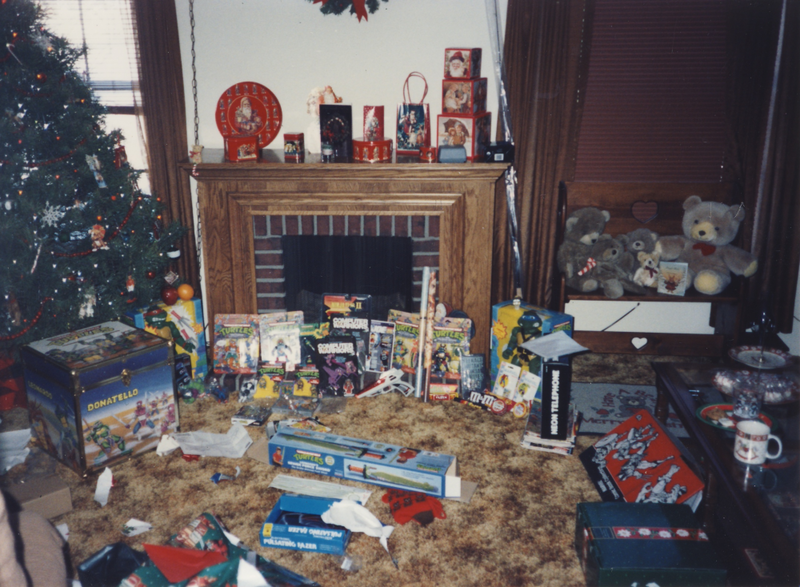 For Christmas in 1990 my parents bought me an orange box with comic characters on it that was basically a grab bag of comics for a beginning comic collector. It had at least one of every comic that was current at the time (mostly comics published October 1989), so it gave me a good idea of what I liked and what I didn't like. Of course, I was most excited about the Spider-Man comics. The Christmas that I got into comics. They also bought me a set of four Toy Biz Marvel Super Heroes action figures. They came in a little box and they were individually wrapped in plastic; they weren't carded. The figures were Spider-Man, Captain America, Hulk, and Punisher. You can kind of make them out in the picture to the left on the floor left of the fireplace. I played with these four figures so much. These toys were the greatest thing that you could ask for. I thought I had some unique thing that no one else could get, but I soon found out that not only were these figures available in toy stores, but that there were even more available than what I had. I remember playing with them under the kitchen table and asking my mom to take me to K*B Toys so we could get a few more. These toys still hold a special place in my heart. I think this coming year during convention season I'm going to try to get as many of them as I can carded. I see them all the time. These were a must own in 1990. 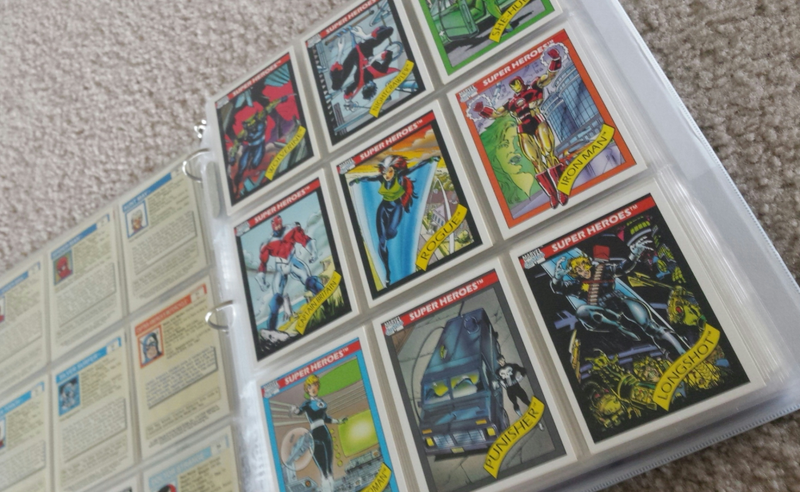 1990 was also the year the first series of Marvel Universe trading cards came out. These cards were very important to my friends and myself at the time. They gave you quite a bit of information about all of the characters. Remember, there was no internet at this time. You couldn't get on Wikipedia and find out everything there is to know about Dormammu. You had your little card with a bit of information and that was it. There were hero cards, villain cards, famous battle cards, team cards, and most importantly, hologram cards. Hologram cards were naturally the hottest thing around. Pulling one out of a pack was an event. After I got into comics and I was buying stuff from Horn's Market, my grandpa told me about a book store in a nearby town called The Book Exchange. It was owned by a man named Jack, and Jack had old comics as well as new ones. They were kept in what looked like a trough next to the counter, and again, I would search through it for Spider-Man comics. Comics with Hobgoblin on them were typically ones I would go for. This store was near where my grandma worked, and we would run by this store often on lunch or on the way home. Eventually I found out about a dedicated comic shop in nearby Carbondale called Campus Comics. As a kid it seemed so far away, but it really wasn't. I remember the hours being where it was difficult to get there before they closed since my dad didn't get home from work until around 4:30 and they closed at 5:00. This is the same store I go to now, though it's not in the same location. It also has a new owner named Mike who is about the best guy you'll ever meet. The hours are better now, too. 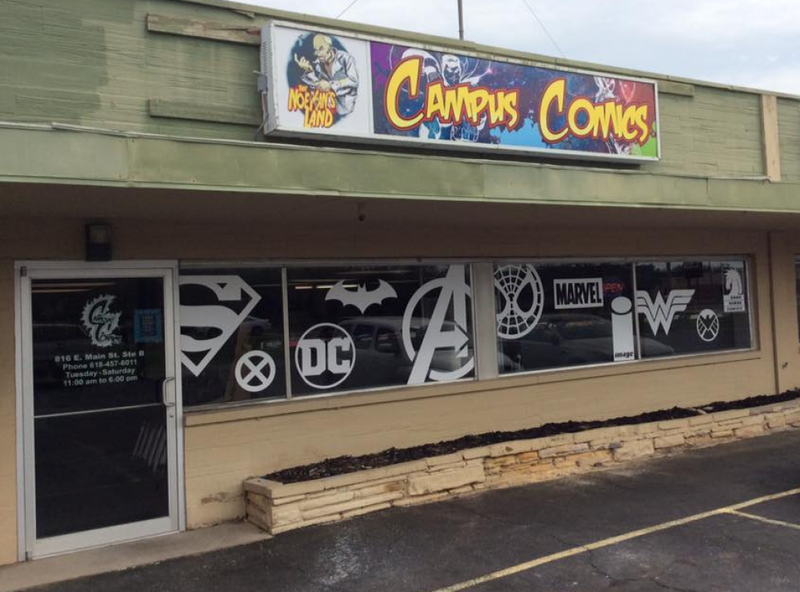 Going to Campus Comics was always a treat. I was able to get things there that I couldn't get elsewhere. The selection was always mind-blowing. Going from a book store that just had some comics by the register to a full on store devoted solely to comics was quite exciting. I went as often as I could, which unfortunately wasn't that often. 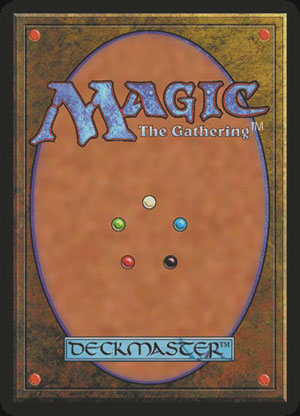 Things were going fine until 1994 when I got into Magic: The Gathering. Suddenly I didn't want to spend my money on comics. Additionally, this was right around the time the infamous Spider-Man clone saga was going on, so I bowed out of comics for about six years until Christmas of 2000 when I randomly received two issues of Peter Parker: Spider-Man. It got me back into comics harder than I was even the first time. I acquired quite a few comic books both old and new, and I had a pull list of about 15 to 20 different books at Campus Comics I was buying, so I was reading quite a bit then. I stayed into comics for several years until early 2013 when Amazing Spider-Man #700 came out. I got out then because I thought #700 was a good place to stop and I had pretty much just lost interest in comics at that point. I tried to get back into them again during the summer of the following year, but nothing grabbed me like I thought it would. So, again, I bowed out. During this phase, however, I purged a lot of my comics. I think I got rid of about 30 short boxes of comics. I got rid of stuff I never thought I would part with, which included a bunch of Spider-Man comics. I kept the core Spider-Man titles (Amazing, Marvel Team-Up, Spectacular, Web, and Peter Parker) but almost every other title was fair game. I also kept comics from my youth like G.I. Joe, Teenage Mutant Ninja Turtles, and the EC horror comics. I definitely didn't get rid of everything, but I had noticeably less after the purge. I've never met them, but I feel like they're my friends. 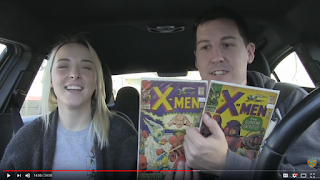 I stayed out of comics until I started watching a show on YouTube called Comic Trips. The show is about two sweet folks named Paul and Kat and their journey together collecting comic books. They visit shops and go to conventions, and it's a lot of fun to see the things they encounter. Watching them do this and get excited about comics made me get excited about comics. January of 2016 I got back into the game, and I've been there ever since. Since my interest has been rekindled, I have gone to several comic conventions over this past summer. I started posting weekly comic hauls of what I got (though I've stopped now due to reasons I won't get into) and various other comic related articles. I have amassed a decent collection of key issues, first appearances, and important story arcs. Basically, even though my collection isn't as vast as it once was, in many ways it's better now than it's ever been. So that's my history with comic books. If you've made it here, then for whatever reason you cared enough to read everything I had to say about something that's not all that interesting. So thank you.